Being Human (U.S.): "Some Thing To Watch Over Me"
"Some Thing To Watch Over Me"
One of the first questions that comes to mind (or to my mind, anyway—the rest of you may have more important things to think about) regarding any ongoing series with a supernatural element is this: What do the normal people know, and how long have they known it? In other words, is it common knowledge that we’re sharing the planet with demons, spooks, and shape-shifters, or is that sort of information strictly on a need-to-know basis? For instance, when True Blood began, vampires had only recently come out of the closet, but by season three, it seemed as if everyone in Bon Temps had some sort of paranormal ability they’d been keeping under wraps. 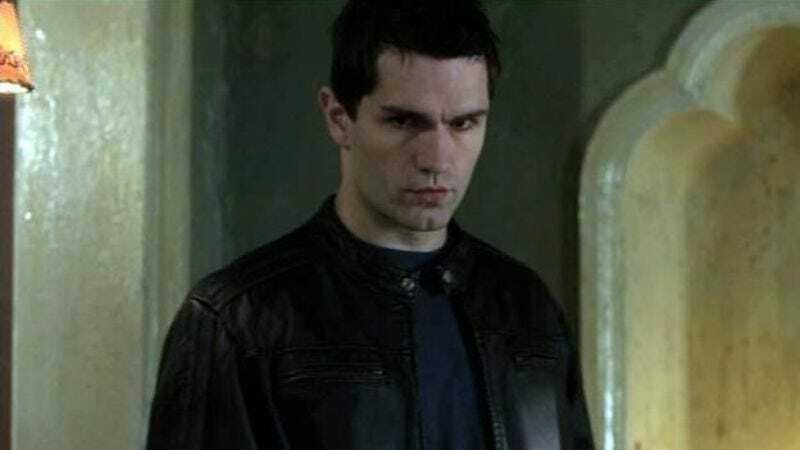 Similarly, Buffy the Vampire Slayer initially posited a world in which evidence of the existence of vampires was greeted with skepticism at best, but by the later seasons of both Buffy and its spinoff Angel, humans and demons were hobnobbing at karaoke bars and keg parties like it was no big deal. Josh doesn’t have as much to do as his housemates this week, although he does draw Neighborhood Watch duty, during which he ends up nearly strangling a graffiti tagger to death. It appears that the wolf within isn’t far from the surface, even when the moon isn’t full. That’s probably a necessary development, given that, of our three protagonists, Josh is the closet to—all together, now—being human. After all, his transformations are completely predictable and containable (at least when his sister isn’t around), so the character has to have some sort of conflict to wrestle with on the 352 days a year he isn’t turning into a werewolf. Although it wasn’t a perfect hour of television by any means, I thought “Some Thing To Watch Over Me” struck the right balance between the show’s darker impulses and the humor implicit in its absurd premise. The characters have grown on me with each episode—Aidan less so than the others, although he’s somewhat hamstrung by having to carry the weight of the larger mythology, in terms of his conflict with Bishop and “the family.” It remains to be seen whether Being Human can maintain this balance with any consistency, but I’m much more encouraged than I was a week ago at this time. Once again, Mark Pellegrino makes the most of his limited screen time. I would rather he never ask me about the saddest thing I’d ever seen, thanks all the same. Nice touch: Josh turning the newspaper pages for Sally. Sadly, this is the last of the episodes SyFy provided for review. I’ll be watching live from here on out, just like you civilians.